Maintaining a safe warehouse is simple, but it does require hard work. Safety in warehouses quickly goes awry when staff get complacent and details are missed. That’s why the most important element of warehouse safety is consistency and attention to detail. As such, this guide is not intended to be read just once. It is a point of reference which you can and should be returning to if you are ever uncertain about an element of warehouse safety. Some general warehouse safety rules, such as the following, should be followed at all times. Identify all potential risks in a given space. Decide who might be harmed by these risks and how. Evaluate the risks and think of potential precautions. Record your findings and implement them in the form of a health and safety policy. Review your risk assessment and health and safety policy regularly and update it if necessary. Risk assessments are recommended for all businesses, but a health and safety policy is only a legal requirement for businesses with five or more staff members. If you own a warehouse, your business will likely fit this criteria. All accidents which take place in your warehouse should be investigated to discover what went wrong. If an accident “almost” happened, that still means something went wrong and incidents like that should be investigated too. HSE’s HSG245 gives more information on the process for investigating accidents and incidents. All staff should receive basic health and safety training, but they also need warehouse safety training, as well as training relevant to the section of the warehouse which they’ll be working in. At Storage Equipment Experts, we offer warehouse safety training in the form of racking inspection training. Contact us for a quote or if you have any questions about racking inspection training. Remember that the CDM Regulations mean that it is your responsibility to know whether your staff are competent enough to do their jobs. If anything should happen, this will become legally relevant. Beyond that, you should bear your staff’s general health in mind. Knowing your responsibilities in this regard is important. If you put an employee in a situation which is particularly dangerous for them because of a health condition, you could be legally responsible. In short, don’t overwork your staff or push them too hard. HSE’s WBK01 offers advice on how to tackle workplace stress. The number one cause of major injury in a warehouse is a slip, trip, or fall of some kind. For causes of absences over three days, the leading cause is manual handling. HSE offers in-depth guidance on best practice for preventing both of these kinds of danger in INDG225 and INDG143 respectively. Safe manual handling and the reduction of slips, trips, and falls both require good practice, but both can also be reduced by creating a safe environment. Floors should have enough friction to avoid slipping and should be free from obstruction. In short, employees should be able to walk around freely and safely. Under the Workplace (Health, Safety and Welfare) Regulations 1992, this is a legal requirement. As well as all this, guardrails are there to protect people from great heights and a good storage system will protect your staff from falling objects. As previously mentioned, though, this needs to be combined with good use. Fire exits — These need to be clearly laid out. The fire safety of your warehouse also needs to be reviewed using the steps from the risk assessment above. Workplace temperature — Your warehouse should maintain an average temperature of around 16 degrees Celsius. If the work involves rigorous physical effort (such as picking, loading, or unloading), it is acceptable for this to be 13 degrees Celsius. Ventilation and light — Your warehouse needs a certain amount of ventilation and natural light to keep the air fresh. You also need artificial light in places where your warehouse may be dark at any point in the day. HSE’s HSG38 offers more information on this. 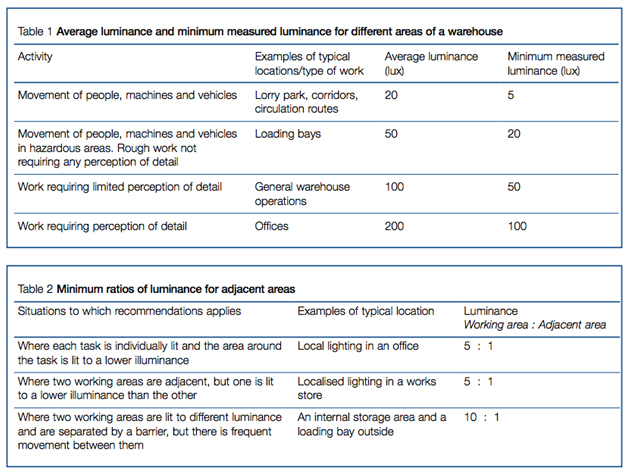 Below is a table highlighting HSE’s recommendations for lighting in certain areas of a warehouse. Asbestos risk — If your warehouse is older, there may be an asbestos risk. From the 1950s to the mid-1980s, many buildings in the UK were built with asbestos. However, we now know how dangerous the substance can be. Asbestos identification and removal can be a long process, so it’s worth getting started as soon as possible if there is any potential that your business might contain it. Legionella — Legionnaires’ disease is caused by a bacteria called legionella. This bacteria thrives in rusty, sludgy water which is between 20 and 45 degrees Celsius. In a big, rusty, unclean warehouse, the risk of legionella increases dramatically. Regular inspection, cleaning and repair of your hot water systems are needed to keep legionella at bay. Basic facilities — You are legally obliged to provide your staff with toilet facilities and places to wash if need be. Staff also need somewhere to change, private accommodation for their clothing, somewhere to eat, and clean drinking water. Personal protective equipment (PPE) — You may need to provide your staff with personal protective equipment (PPE), depending on the tasks they’ll be doing. 1. After the equipment has been installed and before using it for the first time. 2. After the equipment has been moved or in some way reassembled in a new location. 3. If there are any “exceptional circumstances which are liable to jeopardise the safety of the work”. Visible damage is a perfect example of this. 4. At regular intervals. In most cases, this means at least once every six months or twelve months. What’s more, these inspections can’t be performed by just anyone. According to the CDM Regulations, you need to be able to guarantee the competence of anyone working in your warehouse. This should be especially true when it comes to inspections. Work at height safety and materials handling are important because, after slips, trips and falls, they are the reasons for the vast majority of injuries in warehouses. HSE’s guide on work at height should be read alongside the Work at Height Regulations 2005 for advice on best practice for work at height. As for materials handling, best practice for this is covered in HSE’s Manual Handling Operations Regulations 1992. Warehouse safety training is provided in many different forms by many different bodies, depending on what element of safety your staff need to be trained for. With regards to storage equipment, we provide racking inspection training. This warehouse safety training can be provided at your premises or at our training centre. Warehouse health and safety checklists are vital for quick reference and making sure you are following HSE’s advice. As with training, you’ll need a different kind of warehouse health and safety checklist for a different element of warehouse health and safety. Claim your warehouse health and safety checklist from us. For racking equipment safety, we provide a FREE racking inspection checklist for businesses.